Bend the ends of an antiqued gold-plated oval component (filigree) so each end is raised 45 degrees. 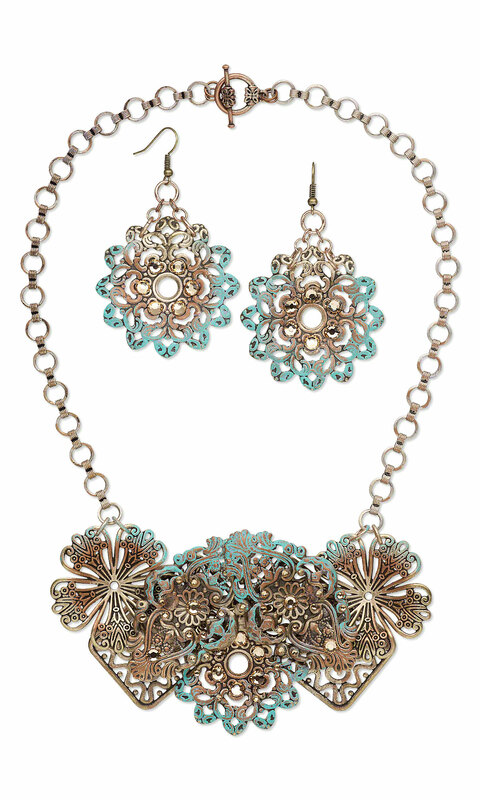 Repeat to create a second bent oval filigree. Using your gloved finger or a brush, apply Gilders Paste to the entire front and back of one bent oval filigree, layering the colors: silver, copper, gold and patina. 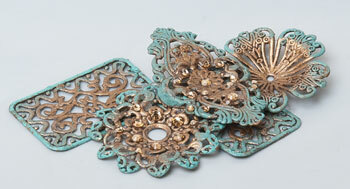 Apply Gilders Paste to all the pieces in the design including the chain and clasp so they match the filigree. Using a brush, apply a topcoat of Mod Podge® matte sealer to the entire piece, including the chain and clasp. Let dry completely. Squeeze out equal portions of each part of the Araldite® two-part epoxy. Using a toothpick or craft stick, mix the two parts together well. 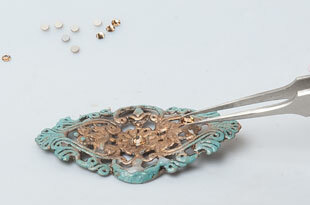 Using a clean toothpick, apply a few dots of epoxy to an area on one filigree where you want to add flat back crystals. Using tweezers, place the crystals into the epoxy. Repeat, adding crystals to all the places you'd like them to be on both filigrees. Let the epoxy cure. Working on a Teflon sheet, place the two antiqued gold-plated rectangle components corner to corner with the short ends facing out and angled down. Apply a dab of hot glue to the corners of the rectangle that overlap. If needed, add another dollop of hot glue to the top of the rectangles. 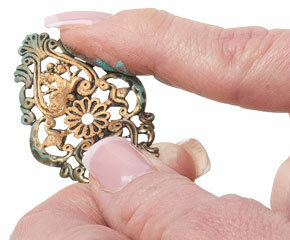 Pressing lightly, place a petal of an antiqued gold-plated wavy flower component into the glue. Note: You want the wavy flower to connect to the rectangles but you don't want the glue to come through the filigree openings. 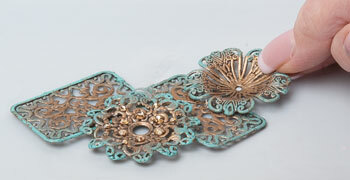 If hot glue comes through the filigree, working carefully, wet your finger and quickly smooth the glue before it cools. 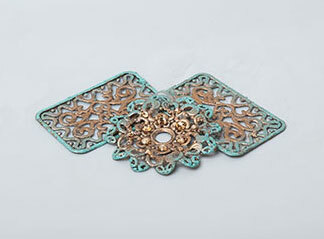 Place a large dollop of hot glue on either side of the wavy flower filigree. Gently place a petal of an antiqued gold-plated fancy flower component into the glue, positioned so the flower extends above the rectangle and creates a gentle curve, again, working carefully so the glue does not come through the openings in the filigree. Allow the glue to cool. Add a dollop of hot glue between the wavy flower and the fancy flower, building up a bit of height, then place the center of the bent oval filigree into the glue. Repeat Steps 7 and 8 on the other side of the assembly. Allow the glue to cool. Peel the cooled piece off the Teflon sheet. Check for stability. If there are any pieces that are not secure, carefully squeeze a dollop of hot glue into the hidden voids and recesses. Allow the glue to cool. 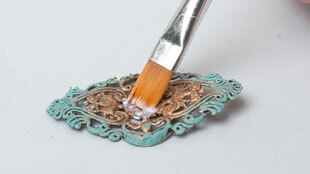 Use a brush to apply Gilders Paste to the hot glue. Also apply Gilders Paste to any areas where you would like more color. Using chain-nose pliers, open one 8mm jumpring. Pass the open ring through an opening on one petal of one fancy flower filigree and the last link on one end of one length of chain. Close the jumpring. Connect a second jumpring to the last link of chain and an opening on an adjacent petal of the fancy flower filigree. Use two 5mm jumprings to connect one half of the clasp to the last link on the other end of the chain. Repeat Step 12 to connect the other length of chain to the other side of the filigree assembly and the other half of the clasp. 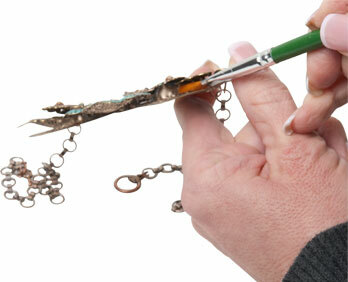 Use the brush to touch up the jumprings, clasp and chain with Gilders Paste. Rinse the brush with mineral spirits to remove the Gilders Paste.